Topics: Commercial, Residential, Case Studies, and Business. It is hosted by Hr Hosting Network At Telecity Manchester (England, London,) using Apache/1 web server. 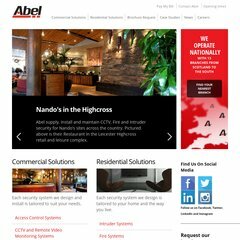 Abelalarm.co.uk's IP address is 212.69.213.174. It has 3 DNS records, ns0.demon.co.uk, ns1.demon.co.uk, and ns2.demon.net.